cataract surgery in The Villages | Lange Eye Institute for cataract surgery. Lange Eye Institute for cataract surgery. If you have been considering cataract surgery in The Villages then you may want to consider coming to The Lange Eye Institute. The Lange Eye Institute has the very latest state of the art eye care center for surgical, medical, optical and nutritional eye care. The Institute has both primary eye care physicians ( board certified optometric physicians ) and Ophthalmologists. Patients from all over the country come to The Lange Eye Institute for their expertise in nutritional eye care and traditional medical and surgical eye care. Cataract surgery is one of the most common surgical procedures done at The Lange Eye Institute and all of the latest technology is utilized to get the most accurate results possible. All of the surgeons at The Lange Eye Institute have done 1000s of surgical procedures ranging from cataracts, glaucoma, oculoplastic and retina. A lot of time is taken with each patient to determine what they are a best candidate for. Many things must be taken into consideration prior to cataract surgery. The doctors and the staff will sit down with the patient and evaluate their lifestyle carefully to determine what type of procedure and implant is right for that individual. Each surgery is customized for each patient. Some of the many options for cataract surgery are: 1. multifocal implants ( allow patient to see far and near without glasses ) 2. toric implants ( correct astigmatism) 3. monofocal implants ( great distance vision if minimal astigmatism, patient will need reading glasses) 4. Monovision ( correct one eye for near and one eye for far). The Surgeons at The Lange Eye Institute are now using the latest in Laser Cataract surgery to even further enhance the results and minimize post operative recovery time. Each patient will also be counseled on what their insurance covers and what is not covered so there will be no surprises financially after the procedure. Seaborn Hunt, III MD is a Board Certified Ophthalmologist with years of experience in Cataract Surgery. Dr Seaborn Hunt has outstanding results using the very latest surgical technology and implant technology at The Lange Eye Institute. Dr Hunt has done thousands of successful cataract procedures on patients that live in The Villages. If you live in The Villages and looking for a kind, caring experienced team to evaluate your cataracts and all of your eye care needs come to The Lange Eye Institute. call 352 753-4014. Where do you go for cataract surgery in The Villages Florida? If you live long enough you will develop cataracts. Everyone knows someone that has had cataract surgery since it is the most common surgical procedure performed in the United States. How do you pick a good cataract surgeon in The Villages? How do you pick a good cataract surgeon in Ocala? Thousands of patients have come to The Lange Eye Institute in the Villages Florida for their cataract surgery. 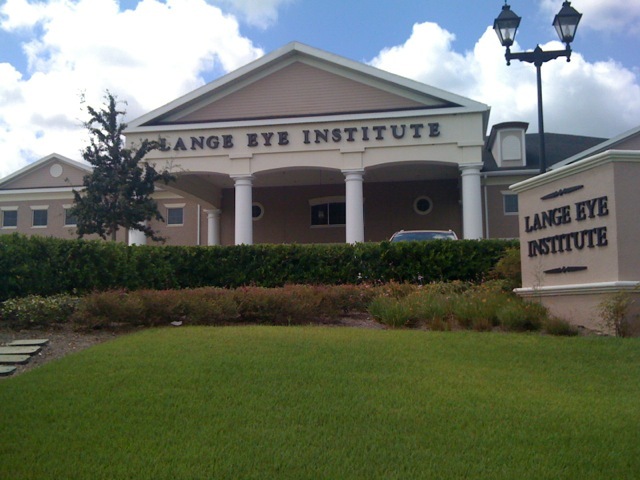 Lange Eye Institute of The Villages, one of the most advanced eye care centers in Florida. The Lange Eye Institute is one of nine locations that Dr. Michael Lange Ocala based eye doctor has built from the ground up. Dr. Langes caring, honest and sincere demeanor has earned Lange Eye Care and excellent reputation in all areas of eye care. Lange Eye Care has a staff of Ophthalmologists and Optometric physicians almost 20 strong. The team of doctors at Lange Eye Care in The Villages and Ocala have a specialist in almost all aspects of eye care. If you are looking for a surgeon trained in the latest in cornea, glaucoma, retina, cataracts or occuloplastics then Lange Eye Care is the place. Lange Eye Care and Associates also has eye care experts in the areas or primary eye care, low vision, sports vision, contact lenses, pediatrics and vision rehabilitation. The Lange Eye Institute in The Villages is the largest eye care center of its type in the area with all of the latest advancements in eye care technology. If you are looking for cataract surgery in The Villages then look no further, The Lange Eye Institute has the most advanced cataract technology and many surgeons trained in the very latest cataract surgical techniques. Lange Eye Care in Ocala and the Villages specializes in multifocal implants, toric implants and spherical implants. The doctors at Lange Eye Care take the time necessary to determine what implant prior to cataract surgery will be best for your particular lifestyle. The staff at the lange Eye institute in The Villages will take into consideration your job, hobbies, sports you play and what your plans are for the future before making a recommendation for a particular implant. The Optometrists and Ophthalmologists are trained precisely on what implant is going to work best for each individual patient. The Lange Eye Institute has used all of the latest implants like Restor, Crystal lens, Rezoom, Technis and the latest in toric implant technology for astigmatism as replacemnts implants during cataract surgery. Cataract surgery in the Villages or Ocala is an area that Lange Eye Care has invested a significant amount of money to insure great results. When doing a pre op examination for cataract surgery in the Villages at Lange Eye Care the patient is put thru a series of very sophisticated measuring devices to make sure all of the measuments are accurate and the calculations are perfect for each individuals implants after cataract surgery. Dr. lange states ” we want the best possible out come for our patients and this is why we have many different types of technology to do similar measurements, we want it correct the first time.” Many of the best cataract surgeons in Ocala area at The Lange Eye Institute in the Villages and Lange Eye Care Ocala. If you live in Ocala and want a great cataract surgeon in Ocala then come to Lange Eye Care on SR 200 across from the mall. If you reside in The Villages and are looking for the best cataract surgeon in The Villages then go to The Lange Eye Institute on the corner of 466 and cr101 next to CVS. u can learn more by going to www.drmichaellange.com or www.langeeyecare.com or in Ocala u can call 352 237 3768 and in the Villages you can call 352 753 4014. The doctors and the staff at Lange Eye Care Ocala and Lange Eye Care The Villages will make sure that you have a great result from cataract surgery and superb follow-up care as well. Dr. Michael Lange states all of the Cataract surgeons at Lange Eye Care have lots of experience and are the tops in their field. Each patient goes thru and extensive workup and series of tests to determine the most accurate implant to use during cataract surgery. Lange Eye care has been getting extremely good results ever since they became involved in cataract surgery in The Villages and Ocala. Ocala and the Villages has a very large retired population that is statistically at a greater risk of developing a cataract. Do to the large volume of patients needing cataract surgery in Marion county the cataract surgeons of Lange Eye Care have a considerable amount of experience. So if you want great results from cataract surgery in the Villages or Ocala come to the doctors at Lange Eye Care. If you are looking for a second opinion regarding cataract surgery in The Villages or Ocala give The Lange Eye Institute a call.For Cataract surgery in Ocala call 352 237 3768. For cataract surgery in the Villages call 352 753 4014. Dr. Michael Lange of Lange Eye Care and Dr. Shalesh Kaushal retina specialist are interviewed on the latest in retina treatments. The latest in Macular Degeneration treatment.